Make the Cinnamon Filling: Whisk together the ingredients and set aside. -Warm milk in a small pot over medium heat until it’s luke warm to the touch but not hot. Add 2 tablespoons sugar and the yeast, whisking to dissolve and break up any clumps. Let sit until it’s slightly foamy and starting to bubble, 5 minutes. -Combine flour, remaining 2 tablespoons sugar, baking powder and salt in a large bowl or in the bowl of a stand mixer fitted with the paddle attachment. Mix briefly to combine. - Add milk mixture and egg to the mixer on low, stir to combine. Scrape the dough off the paddle and sides of the bowl. Add melted butter and continue to stir until a shaggy lump of dough forms, again scraping down the paddle. - Turn dough out onto a lightly floured work surface, or keep in the mixing bowl and change to the dough hook attachment. Knead dough until it’s smooth, shiny and elastic, 5 minutes. You shouldn't have to add any more flour at this point, but if the dough seems especially sticky, give it a light dusting. - Lightly grease a large bowl with nonstick spray or vegetable oil and place dough in the bowl. Cover tightly with plastic wrap and place in a warm, draft-free area. Let sit until the dough has about doubled in size, 2 hours. -Punch dough down to release any air that has built up. Cover tightly with plastic wrap, place in the refrigerator and chill the dough for at least 3 hours and as long as overnight. - At this point mix together filling ingredients until a sandy texture forms. Leave out at room temperature until ready to use. -Once dough is chilled and stiffened up, turn it out onto a lightly floured work surface and roll to a 16 x 10-inch rectangle. The rolled dough will be about ¼ inch thick. -Spread filling evenly across rolled dough. You want it to be a heavy layer of filling but not thicker than the dough itself. -Starting at the end closest to you, roll dough up into a tight coil, pressing lightly as you roll to make sure there are no gaps between the dough and the filling. -Cut log into 8 even pieces, about 1 3/4-inch thick. Lightly spray a 9 x 13-inch baking dish with nonstick spray and arrange dough in three rows of three pieces each, with the spiral facing upward and with space in between each piece. At this point, the rolls can be covered tightly with plastic wrap and refrigerated overnight. 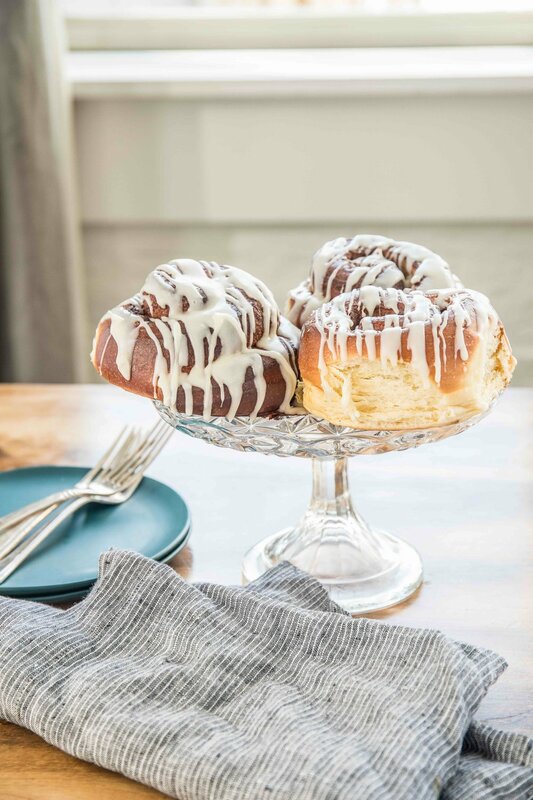 If you plan to bake off in the same day, cover with plastic wrap and allow to proof again in a warm place for 3 hours, until rolls are visibly fluffy. Heat oven to 375 degrees. Place rolls in oven and bake until they are golden brown and fluffy and the sugar has started to bubble up around the edges, caramelizing on the sides of the buns, about 35 minutes. In a stand mixer fitted with a paddle attachment whip butter and cream cheese until light, about 2 minutes. Turn mixer to low speed and add remaining ingredients until well incorporated.